Adam Richman, of Man vs. Food, Man Finds Food and NBC’s Food Fighters, recently released his first travel memoir/cookbook, Straight Up Tasty: Meals Memories & Mouthfuls from My Travels. Adam put together the collection of recipes based on the ingredients, techniques, and flavors he encountered through his travels. The book also features burger recipes he created especially to pair with Alamos Wines. 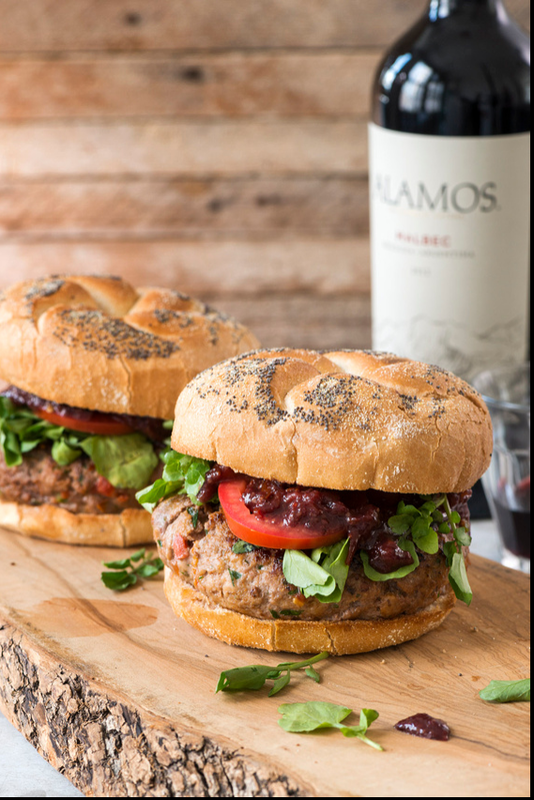 Here’s the recipe for his twist on the traditional burger, Malbec Burger with Creole Mustard Tomato Jam, courtesy of Alamos Wines. One more thing! Alamos Wines invites you to submit a photo of your most daring food and wine pairing to their Dare to Pair Contest. Adam Richman will select a Grand Prize winner who will receive an all-expenses paid trip to New York to join him for an exciting dining experience in the city. More details here. Makes 5 entrée size burgers or 10 sliders. Preheat oven to 375° F. In a large bowl, mix all burger ingredients except rolls and olive oil using your hands until evenly incorporated. Make into 5 large (entrée size) or 10 small (slider size) patties and set aside. Over high heat, heat an oven safe pan until drops of water skitter across its surface. Pour in enough olive oil to coat bottom of pan by one quarter of an inch. Heat oil for 30 seconds. Place patties in pan, working in batches if necessary. Cook patties until browned on bottom and then flip and brown the other side. Remove burgers to baking sheet lined with aluminum foil. Repeat until all burgers are browned. Place burgers in preheated oven for roughly 5 to 7 minutes for medium doneness. Place on grilled buns and top with watercress, sliced plum tomato and Creole Mustard Tomato Jam. Serve hot. Cook down all ingredients except mustard in a small saucepan, stirring constantly until thick and relatively uniform in consistency. Mash all bits of tomato into sauce. Remove from heat and place in a nonreactive bowl to cool. When just above room temperature, stir in mustard.